After visiting Lowton St Mary’s in April, it was lovely to return to share more stories and write with Year 3 and 4. The morning started with a KS2 assembly. 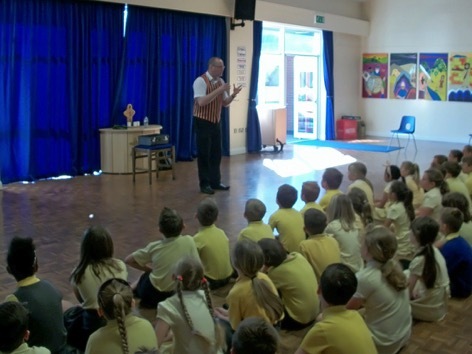 I put on the storytelling waistcoat and shared ‘Junk from the Trunk’, one of the Tales from the first book. We started off in a junk shop and ended up on a pirate ship! Despite walking the plank, we all made it back safely. The children listened really well and they were a perfect audience. Next stop was Year 3. The children had read ‘Blown Away’ from my first book and the challenge was for the class to create an alternative ending to the version in the book. We recapped the story, pulled apart my ending and then shared ideas before the children planned their versions. 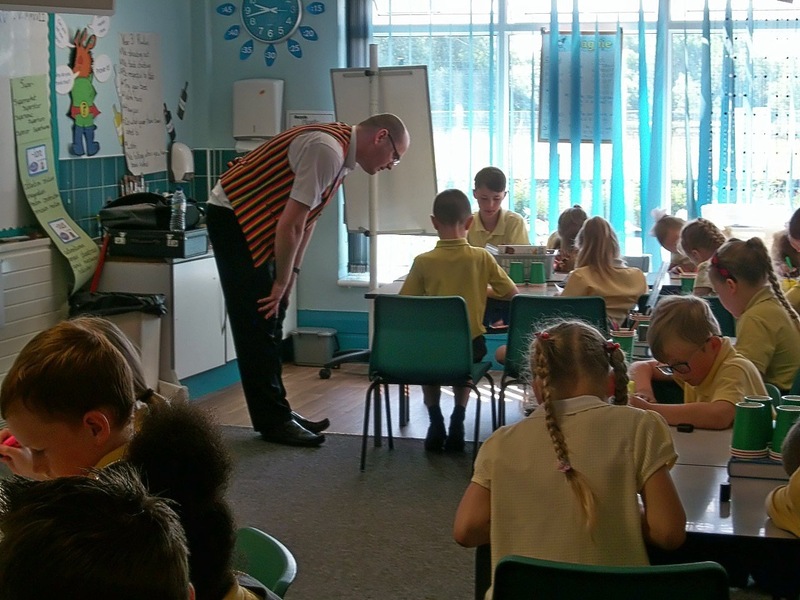 The ideas flowed and by the end of the session, I left the class with the pupils raring to write. Break was taken up with a book signing. There are lots of copies of all three books in school now and I wish the children many happy hours reading them! The final part of the morning was based in Year 4. The class had also read ‘Blown Away’ and were really up for some writing action. They generated lots of ideas – some I wish I had used in my story – and even managed to make a start on their first draft. I handed over my waistcoat to some of the pupils so they could share their writing. If the first drafts are anything to go by, the edited work will be mind-blowing! My time at Lowton St Mary’s was both enjoyable and memorable. It’s a lovely place and I was made to feel welcome and my time valued. Thanks must go to Mr Sherriff for inviting me along. Hopefully I’ll get to visit again at some point in the future.